Germany's groundbreaking law on feeding renewably-generated electricity into the grid came about because of an unlikely alliance of two politicians from opposite poles of the political spectrum: Matthias Engelsberger and Wolfgang Daniels. Engelsberger was a conservative politician from Bavaria's Christian Social Union (CSU), sister party to the Christian Democratic Union (CDU), Germany's larger conservative party. He had a long-standing beef with incumbent electric utilities and their monopoly over generating electricity. Daniels was an anti-nuclear activist and a member of the Bundestag, Germany's parliament, from Die Grünen--the Greens. He was also from Bavaria and he too had a beef with utilities that were preventing the growth of renewable energy. Engelslberger didn't much care for the Greens, says a 2006 article in die Zeit, from which much of the following is derived. He is quoted as having said, “I don’t normally have anything to say to the Greens.” Nevertheless, he found common ground with Daniels and therein lays one of the great tales of renewable energy. Note: I've written extensively about renewable energy, German renewable energy policy, and feed-in tariffs. This tale is well known among the cognoscenti. So well known I was sure I'd written about it before. Yet I couldn't find any mention of it on my web site, though I did find notes on the subject from a decade ago. Because of recent interest in this now historical subject I've pulled together the bits and pieces floating around my hard drive. Note that the source documents are in German. I am not fluent in German. This represents my best guess of the story. Other authors fluent in German have no doubt covered this territory. See books by Craig Morris, David Jacobs, and Volkmar Lauber. The story is important because it shows how great changes in policy hinge on opportunity and serendipity. The rise of renewable energy did not grow out of the goodness of electric utilities. Far from it, renewable energy owes its existence to a struggle to take control from the incumbents. As Hermann Scheer said in one of his books. You don't ask the utilities how to develop renewable energy. In a democracy you tell them how you want to do it. Engelsberger was winding up his career as a federal politician. It was his last year in office and he wanted to take on a pet peeve of his—getting paid a fair price for hydroelectricity produced by his constituents in the mountainous southern part of Germany. He had a plan how to implement an idea he’d had for some time. For 21 years Engelsberger labored as a party loyalist in conservative southern Germany, working quietly in the background. Now it was his turn. For decades Engelsberger had a running conflict with the powerful electric utilities who wouldn’t allow hydroelectric power from independent generators, such as himself and members of the Bavarian hydro association. Engelsberger’s family had a long history with water power. His father had powered his village with electricity from his hydropower project at the turn of the 19th century. This was at a time when electricity was only available to those living in large cities, such as Munich. Die Zeit said that Engelsberger and the Green Party's Daniels had only two things in common; they were both from Bavaria, and they both were scientists. But the two found common ground in liberating independent power producers from the grip of monopoly utility companies that controlled generation, distribution, and sales of electricity. However, this alliance between a CSU member and a Green worried the Conservative Party hierarchy. If they were seen working with a Green, where could this lead. Party leaders didn’t want the Greens to get any credit for such a policy that was so obviously green, thus, the motion was made to leave them out of the proposal and stamp the CDU/CSU’s name on it. At the time, the CDU/CSU ruled Germany under Chancellor Helmut Kohl in coalition with the neoliberal party, the FDP. Angela Merkel, Kohl's understudy, was the CDU's environment minister. More significantly, the economics ministry was in the hands of the FDP's Günter Rexrodt. The FDP is even more conservative than the CDU/CSU. Normally, the pro-nuclear FDP could be assumed to oppose such a provision as proposed by Engelsberger that would weaken the grip of electric utilities. To everyone’s surprise, the FDP's Rexrodt signed onto Engelsberger’s bill. Altogether, the bill was signed or sponsored by 70 Conservative Party members, including the party leadership. When the bill was brought up, it got lost in the debate over the reunification of East and West Germany. Germans and Germany were confronting much bigger issues then than a few water power projects in Bavaria. Despite this, with critical support of the party leadership, and Engelsberger's persistence, the bill sailed through the Bundestag at the last minute. 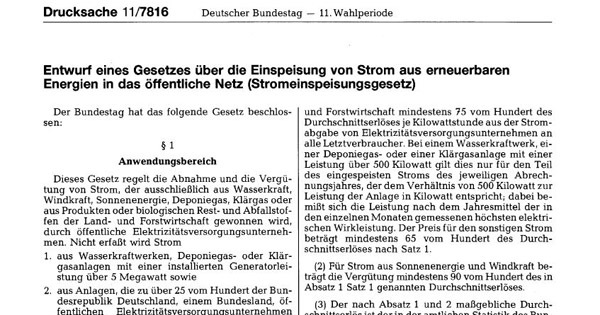 The Stromeinspeisungsgesetz (StrEG) or law on feeding electricity into the grid passed 7 December 1990 and went into effect at the beginning of 1991. It was a remarkable accomplishment, and remarkably simple, totaling a dozen or so paragraphs. In essence, small power plants were allowed to connect to the grid and the law spelled out how much they were to be paid for their electricity. Electricity from hydro, biogas, and landfill gas would be paid 80% of the retail rate. Wind and solar generation would receive 90% of the retail rate. It was revolutionary. In 1991, said Die Zeit, there were only 1,000 wind turbines in Germany. By 2000 when a new law on feeding electricity into the grid was introduced it was ten times that amount. Today Germany generates more than one-third of its electricity with renewable energy. The utilities fought a rearguard action for years after passage of the StrEG. It wasn’t until 2001, a full decade later, that the European Union’s highest court ruled that Germany's feed-in law was not a form of state subsidy. Generators were paid for the cost of their electricity, much like any other utility generator, the court ruled. No state or taxpayer funds were involved. The law on feeding electricity into the grid became the stepping stone for the even more successful Erneuerbare-Energien-Gesetz or Renewable Energy Sources Act of April 2000.